Since launching UK shipping I'm pretty sure Glossier has been featured on at least 3/4 of UK beauty blogs. Not to be one to avoid getting involved I thought I would stick my opinions into the giant barrel of opinions, all be it a little late. I actually got this stuff off my grandparents for Christmas so have been giving it a good trial in the past couple of weeks. So starting off with the skincare, I got the Phase one starter set. This included the Milky jelly cleanser, the Priming moisturiser and a Balm dot com. I was hoping I would be able to use the Milky jelly cleanser at night as I had heard it was quite nourishing however for me, who admittedly does wear a lot of makeup it is just not enough. I find that when I'm wearing basic makeup this does a perfectly good job of removing it however when it comes to my everyday makeup it just doesn't quite have the kick I need to get everything off. That being said it has fit really well into my morning routine and is really lovely and refreshing for a morning cleanse. The Priming moisturiser is a really lovely product for under makeup. It has a slight tackiness meaning makeup sticks really nice to it. I don't find on my dry skin this is hydrating enough to use as a moisturiser however as a primer type product it works really nicely. Finally for phase one we have the Balm dot com, I went for the cherry flavour and I have to admit I was a teeny bit disappointed it is just very synthetic and I sort of wish I'd gone for a lesser scented version. It has a slight red tint to it which isn't too much even when I'm not wearing any makeup it just makes the lips look really nice and plump. In terms of moisturising it's no Nuxe Reve de meal but it is up there with my favourite balms. Moving onto the makeup I got two of the sets, the first being the Cloud paint duo. I went for the shades Haze which is such a beautiful peachy brown natural colour. It almost adds a little sculpting to the face and is definitely the one out of the two I've used the most. The other shade I picked out is Dusk which is an almost jam colour. It isn't half as scary as it looks and blends out to a really stunning slight berry toned flush. These are like nothing I've ever tried before, they are almost slightly gel like in texture and blend out beautifully even over powdered skin. I find I can use a beauty blender, my fingers or a brush to blend and they still look gorgeous. The other makeup based set was the Phase two set which includes the Stretch concealer, Boy brow and a Generation G lipstick. I was expecting to really love the Stretch concealer as Anna from Vivianna does makeup mentions it all the time however I find personally it just doesn't quite pack the punch coverage wise. It is really gorgeous and hydrating I just wish it did have a little more coverage. This is definitely one I will be using on lower coverage makeup days. The Boy brow is an amazing brow gel which reminds me a lot of the Benefit Gimme brow. I got the shade brown which is a really nice ashy deep brown shade. I think out of everything this is one of my favourites along with the Cloud paints. Finally we have the Generation G lipstick, I picked the shade Jam in the end which is a beautiful berry shade. The formula of these is so strange and like nothing I have tried before. They are incredibly matte but also very sheer. 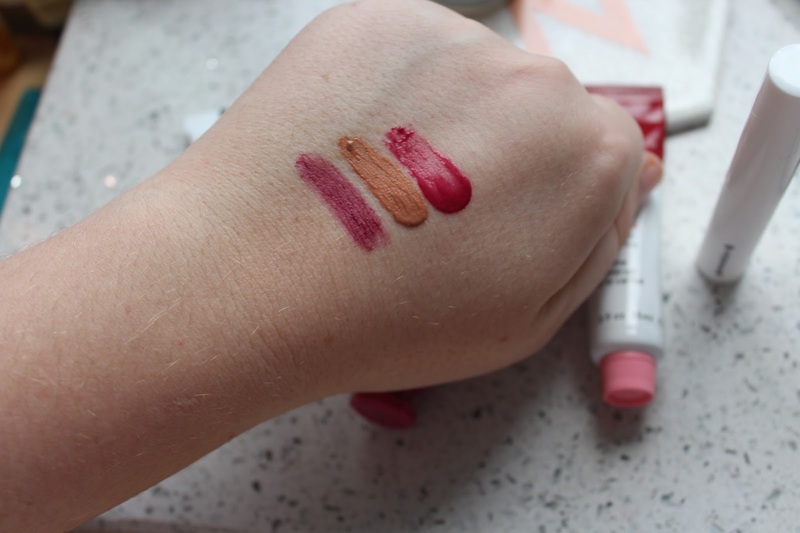 I wasn't;t sure how I'd feel about the formula however I am actually really impressed, I love this shade as it gives a stunning berry tone to the lips. 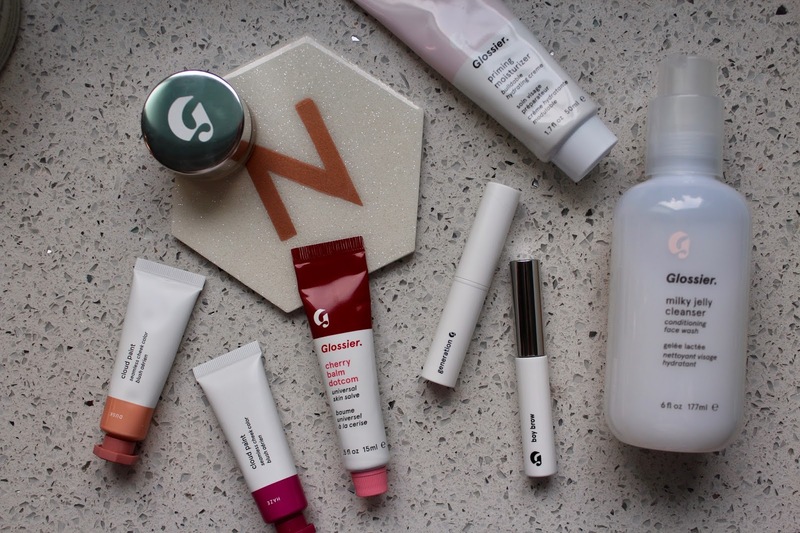 Overall I have been pretty impressed with the Glossier range however there have been a few products that I don't think live up to the huge hype surrounding them. Oooh how gorgeous is that range! I've seen so much hype about their products and some of them are vegan! Glad you were impressed by them, I love the look of the cloud paint duo! I have been wanting to try a glossier box for a while! The more i read the more i want one! I am so pants at putting liquid/cream products over the top of powders it scares me so much! Impressed you can blend them out! It just doesn't work for me. I agree with you on the balm - doesn't look too great tbh! I hate how much the smell of something is a total deal breaker. I have been trying them too, I find them alright, but I don't understand all the hype around it. Like I quite like the blush, and the balm is ok if you just want pretty non moistursing look, but overall its just a bit meh. I love their Cloud Paint in the shade Puff and the original Balm Dot Com. Absolutely love how honest this review is!! I haven’t tried anything from glossier yet but have seen so much on the jelly cleanser. I did wonder if it would be good as an evening cleanse. I bought this set too when they first launched in the UK and the cleanser does nothing for me! I had a very mixed bag with my first haul - some really faves and fails! I still want to try more though!